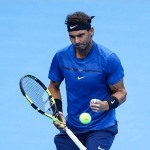 Top seed Rafael Nadal will begin his quest for an 11th French Open title against lucky loser Simone Bolleli, who was gifted a place in the men’s singles main draw after Ukrainian Alexandr Dolgopolov withdrew due to a prevailing wrist injury. The question here is can anyone beat The “King of Clay”? The Spaniard could potentially meet 27th seed Richard Gasquet in the third round but the Frenchman’s mediocre record at his home Slam and on the surface suggests that he wouldn’t pose much of a challenger for Nadal. Rising teen sensation Denis Shapovalov is a possible opponent for Nadal in the last-16. The Canadian, who is seeded 24, will be making his debut at Roland Garros and starts off against Australian John Millman. Shapovalov is coming into the French Open on the back of an impressive run in the clay season but already lost to Nadal this year as he was stopped by Nadal at Rome in the third round. His fearless play and zipping one-handed backhand should help him reach the second week, but if he comes up against Nadal again, the Rome result will probably repeat itself. Sixth seed Kevin Anderson rounds up Nadal’s quarter of the draw, who opens against Paolo Lorenzi and is projected to meet Nadal in the last-eight, should he make it that far. Marin Cilic suffered a slump in form after reaching the Australian Open final in January but seems to have regained confidence after reaching his first-ever Masters 1000 semi-final on clay at Rome. Novak Djokovic hasn’t won a Slam since he lifted the French Open trophy in 2016 but his recent run in Rome, where he lost in the semi-finals to Nadal, showed that he is finding his way back to the top. Dominic Thiem is the only player to have defeated Nadal on clay this year and he comes into the French Open on the heels of winning his 10th ATP title at Lyon. He has reached the semi-finals of Roland Garros is the last two years, so his big challenge is to at least make the final.